Canada sparked headlines around the world this winter by making its national anthem “gender neutral”, modifying the lyrics to give equal recognition to all sexes. The nation’s athletes mumbled their way through the new version at the 2018 Winter Olympics in Pyeongchang as the country racked up 29 medals. “Canadian women play major roles in all spheres of society, and their contributions should be reflected in one of Canada’s most cherished national symbols, the anthem,” says Dominique Tessier, spokesperson for the Ministry for Canadian Heritage. The proposed change, however, was met with fierce opposition by those who described it as an affront to the nation’s heritage. Liberal Senator, Joan Fraser criticised the change as “clunky, leaden and pedestrian” while Conservative Senator Michael MacDonald denounced the need for a “social justice warrior seal of approval” as “political correctness”. “If we are constantly revising everything because it was written in another generation, our national symbols will have no value. Our history means nothing in this country anymore, and it’s a shame that we’re doing this.” he said. But the edit was seen as a victory in the eyes of supporters, particularly in the wake of the #MeToo movement, which saw thousands of protesters on the streets in cities such as Toronto, Montreal, and Ottawa. Women, trans-gender, and people of every conceivable identity will be officially recognised when the anthem is sung by primary school students, athletes, and soldiers deployed overseas. 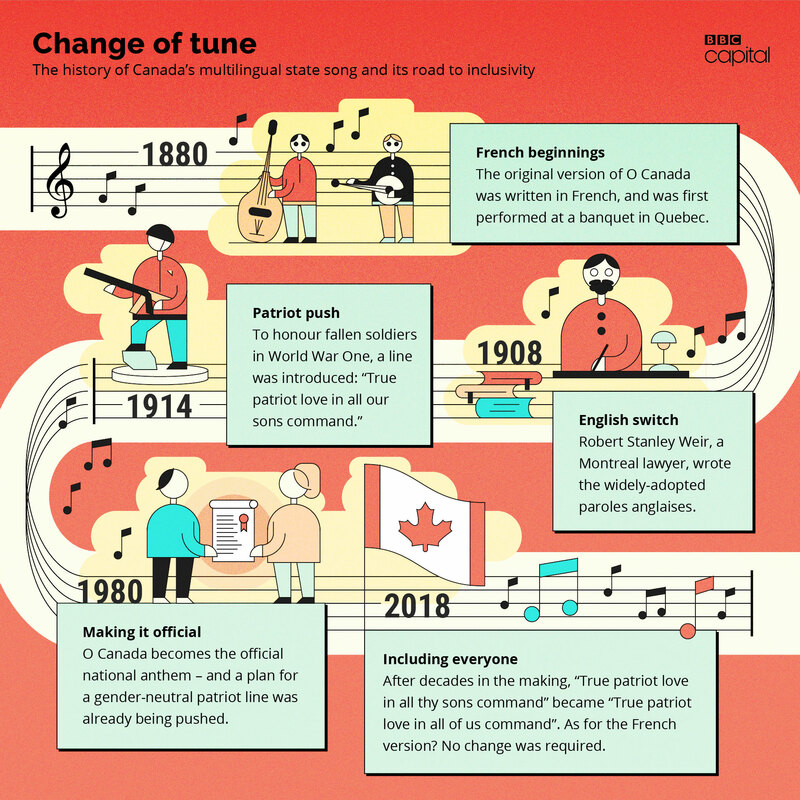 Canada follows in the footsteps of Austria, which changed its anthem in 2012, and other countries such as Germany and Peru now toying with the idea. The answer, perhaps surprisingly, is nothing. Zero, zip, zilch. It has not cost the public purse a single dollar. This prudence is interesting and in sharp contrast to other costly moves to change national symbols. A failed 2016 campaign to change the New Zealand flag, for instance, cost taxpayers millions of dollars. After the votes the NZ Department of Prime Minister and Cabinet released a breakdown of costs of two flag referendums, which showed it cost NZ$21.8m or US$15.3m. The first postal referendum cost NZ$9m (US$6.32m) alone, while the fees and travel of the 12 members of the Flag Consideration Panel cost NZ$284,000 (US$199,291). Changing currencies can also be an expensive process – The Bank of England redesigns its notes every 20 years and the fifth redesign of the £10 note introduced in 2017 now features writer Jane Austen but if heir to the throne Prince Charles becomes king, new notes and coins will immediately go into production bearing the new monarch’s portrait. So, perhaps it is fair to consider that the wider perception must have been that this change risked becoming very pricey? And after all, the Canadian government has form here – removing old insignia and weaving gold braid, “pips” and crowns back onto naval and military uniforms cost more than CDN$4.5 m (US$3.5m). “The change to the lyrics will be introduced as part of the normal refreshing or reprinting of materials – if and when needed – so there will be no additional costs,” says Tessier. The ministry has an ongoing budget for a variety of printed materials related to the federation, she explains, and they simply reprint from time-to-time when new supplies are needed. Updated versions, which would be produced regardless, will simply have new lyrics – using only as much ink as when they were first published. It was decided that publicity campaigns to advertise the change would be unnecessary: the new lyrics will spread through media coverage and word-of-mouth. “This is already happening – and it’s been happening for decades. I’ve been singing the different lyrics myself for 25 years, as have various women’s groups and choirs across the country,” says Lankin. Bill C-210, passed by Parliament in June 2016, was just one of 12 bills that had already been tabled over the last four decades. “So, this really was just a piece of unfinished business,” says Nancy Ruth, a feminist and a ‘red Tory’ or “fiscally conservative but socially concerned” as she puts it – who served in the Canadian Senate from 2005 to 2017. If it cost nothing, why such a fuss? In fact, the contested line “in all thy sons command” itself was a modification of a phrase that was gender neutral in the first place. 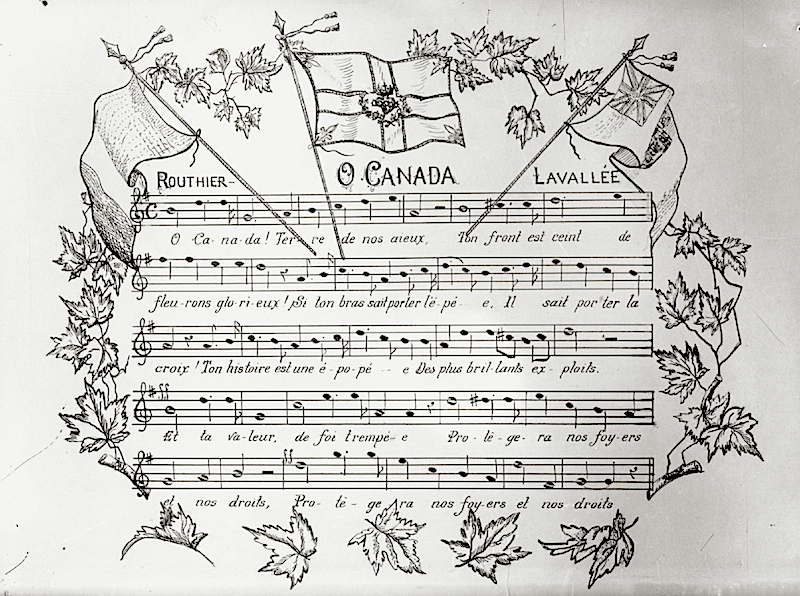 When Robert Stanley Weir penned the English lyrics to O Canada in 1908, he composed: “True patriot love thou dost in us command”. Those words were changed in 1914 to honour the men and boys fighting in World War One. She points out that most of the bills were tabled by men who cared passionately about getting the song changed. The most recent and final bill, was sponsored as a Private Members Bill by the late Liberal MP Mauril Bélanger (1955 – 2016). By the time his bill reached a second reading in Parliament, Bélanger was in hospital, slowly dying from ALS (Amyotrophic lateral sclerosis, also known as motor neurone disease). MP Bélanger died two months after Parliament passed the bill – but it took another 18 months for the Senate to pass it.